Douglas Adams is one of our very favorite people here at GFR, and his Hitchhiker’s Guide books are some of our very favorite things. Although it’s been through many incarnations over the years, from novels to TV series to movies to games, die-hard HHGG fans will recall that we were first introduced to Adams’ deliciously goofy universe in the form of a BBC radio play first broadcast in 1978. That led to Adams’ releasing the first novel in 1979, the BBC TV series in 1981, and so on. 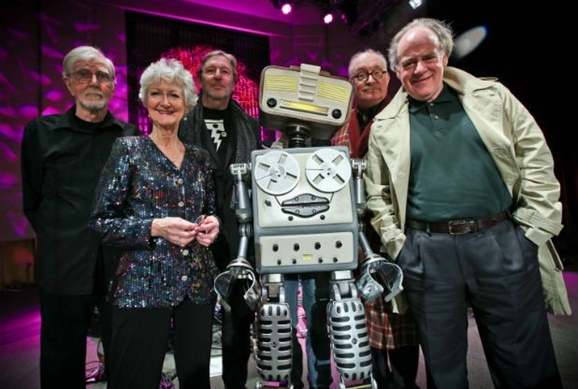 Well, the BBC recently returned the Hitchhiker’s Guide to its roots, reuniting the original radio cast for a live stage performance at London’s BBC Radio Theatre. But don’t panic just because you missed the show: you can listen to the entire performance online, courtesy of BBC Radio 4. 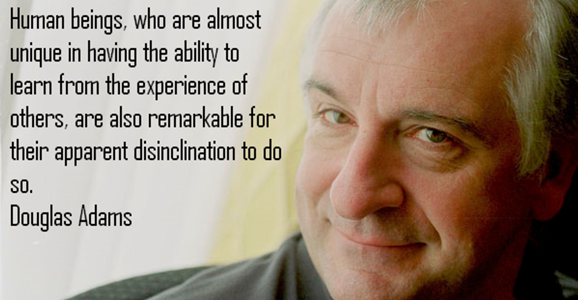 The late Douglas Adams was born on this day in 1952. He would have turned 62 today, and it’s still a damn shame that we lost him at the criminally young age of only 49. (From a heart attack, after working out — a cruel twist that, I have to think, he would have seen the dark humor in.) Still, his legacy lives on, and will as long as people keep reading his inaccurately named Hitchhiker’s Guide to the Galaxy “trilogy,” not to mention all his other works. One of the things we love most about the Hitchhiker’s Guide stories is Adams’ bountiful imagination when it comes to conjuring up crazy ideas for the beleaguered Arthur Dent to run across during his tours of the galaxy. In honor of Adams’ birthday — and of all the joy his stories have given us over the years — we decided to highlight some of our favorite Adams inventions. Thanks to smart phones, tablets, and the Internet, most of us are effectively walking around with a copy of the Guide in our pockets or purses, even if most of them don’t have that comforting phrase “DON’T PANIC” emblazoned on them But here are some other Adams inventions that, if there were any justice in the world, would be totally real. Something weird is going on in the Gulf of Mexico. Granted there’s always something weird going on in the Gulf of Mexico, whether it’s a destructive hurricane or a massively destructive oil leak. But this time it’s weird and completely unexplained. The dolphins are dying. We’re not talking about a couple of dolphins beaching themselves, man’s ocean-faring friends are dying by the thousands. In the past two years 714 dolphins have washed up, dead, on the Texas/Louisiana shore. To put that in perspective it’s normal to find about 74 dead dolphins a year. If we’re finding 714 dolphins dead on the beach that almost certainly means thousands more dead out in the ocean and not actually washing up… because these dolphins aren’t beaching themselves. They’re already dead when they wash up on the beach, partially decomposed and in pretty bad shape. Dead dolphins normally sink so odds are we’re only seeing a fraction of the total death toll.